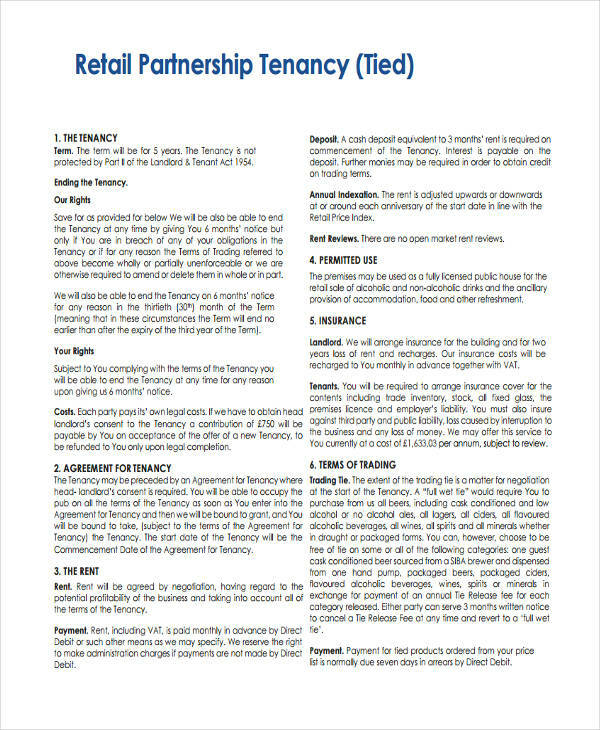 Partnership broken down to its purest form is an arrangement between parties, namely partners, with the intent of increasing their mutual interests. 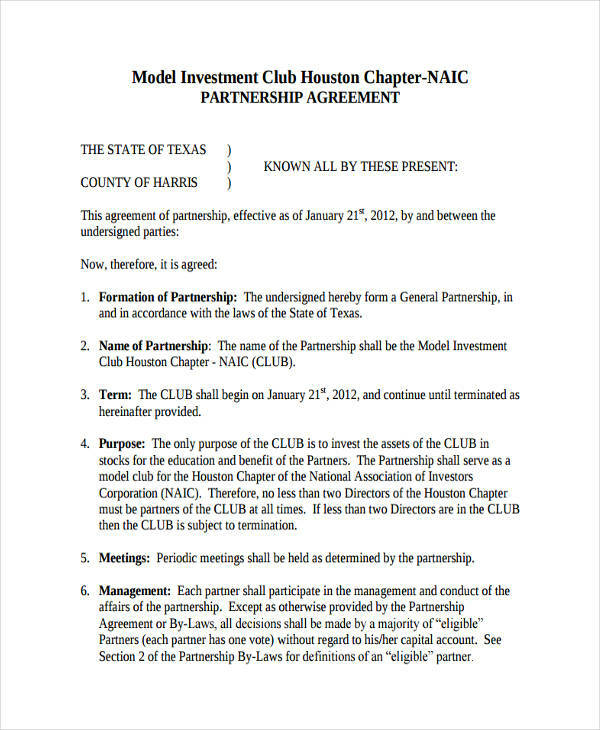 A partnership can be shared between individuals, business, organizations, schools, and government. 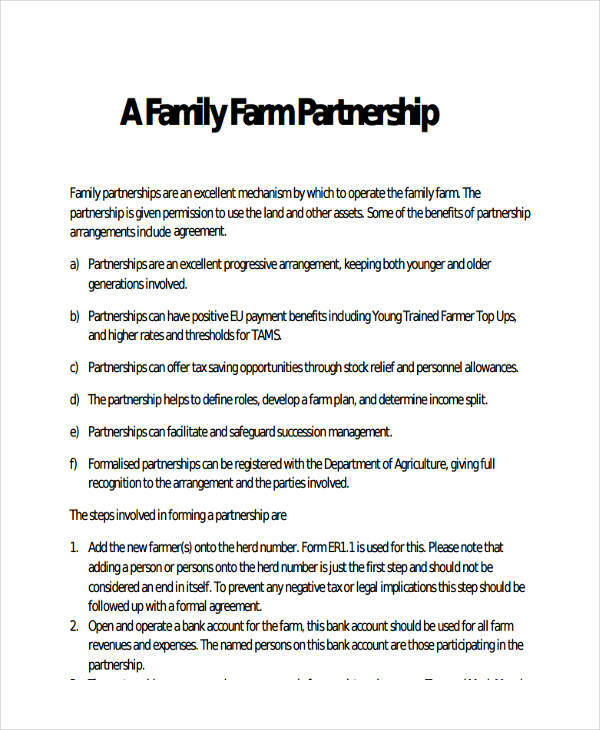 While having mentioned the most common partnerships, partnerships can also be a combination of any of the ones mentioned. 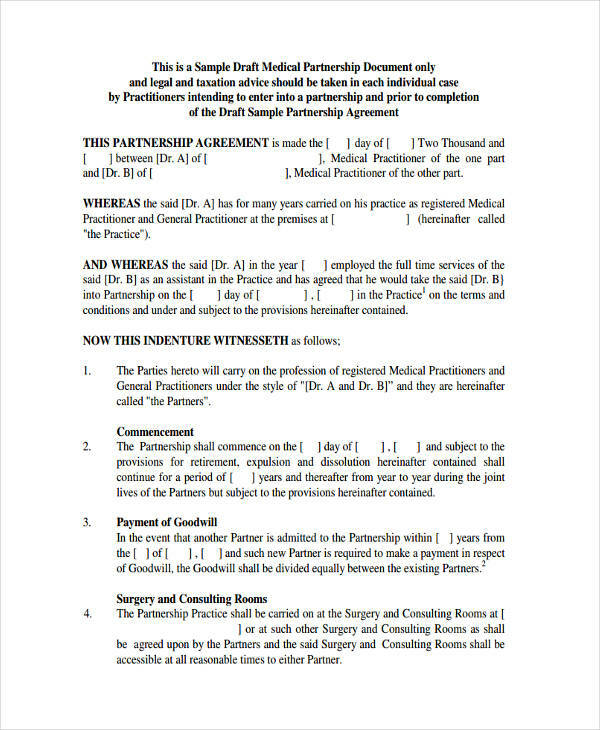 A break in a partnership often results in the breach of any contract of partnership. 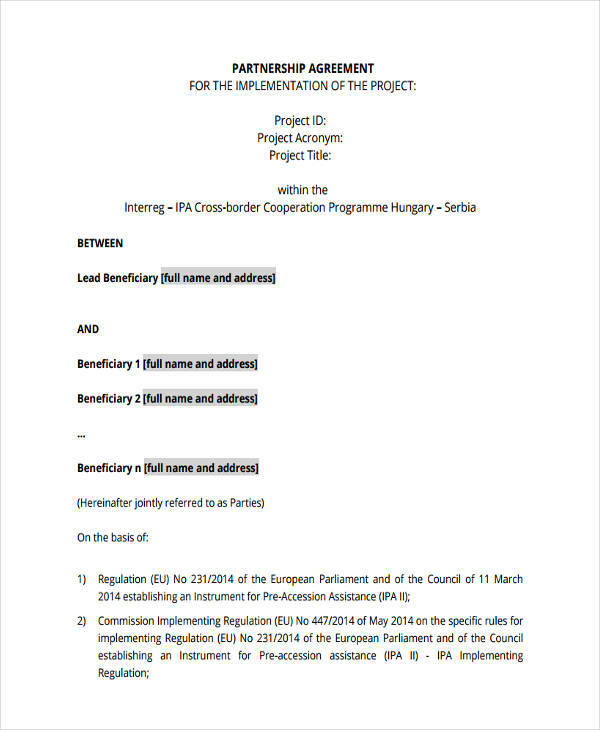 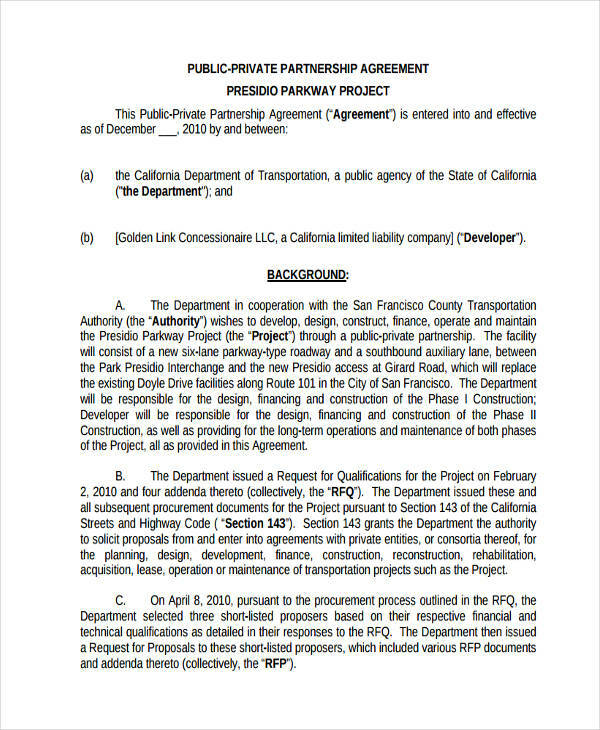 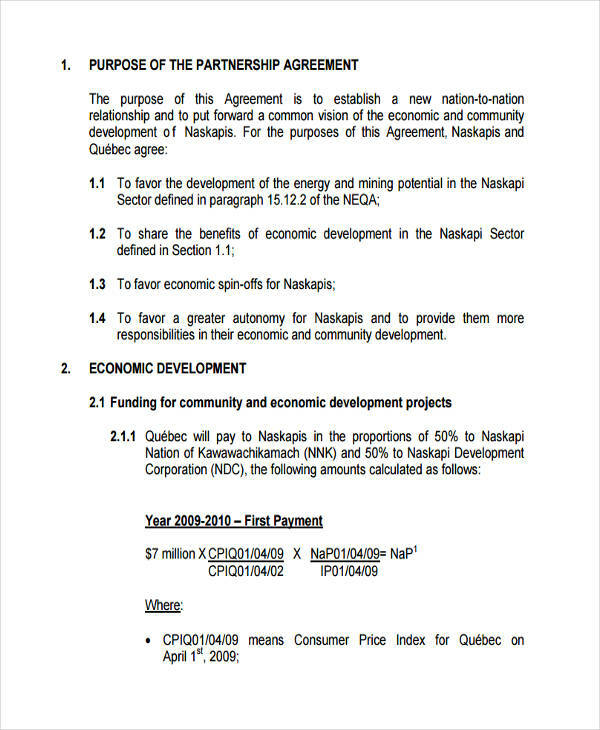 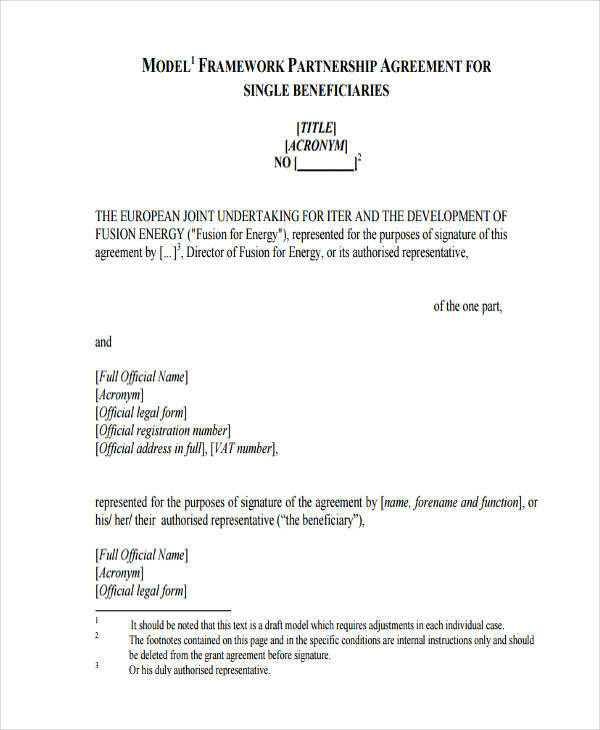 Various partnership agreement examples can be found on this page. 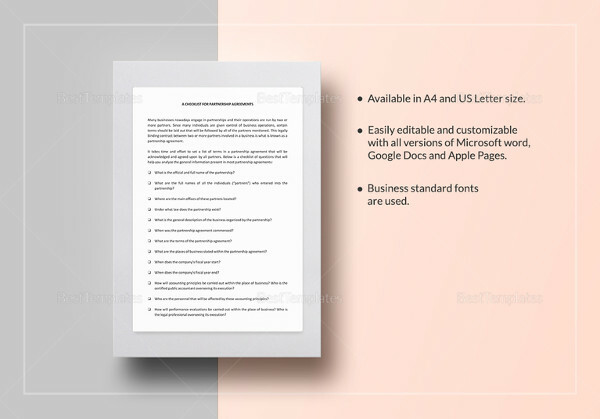 They are available for download and can be done so by clicking on the download button. 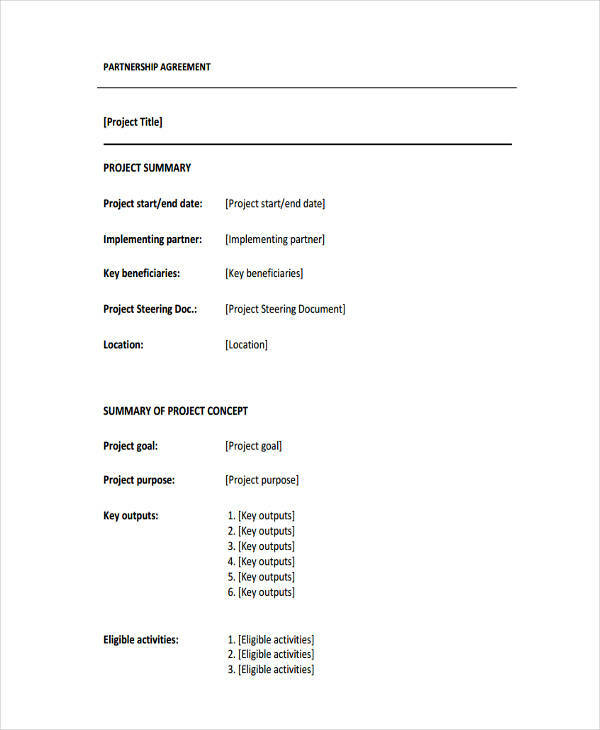 Feel free to have a look at the examples to see if one fits your need. 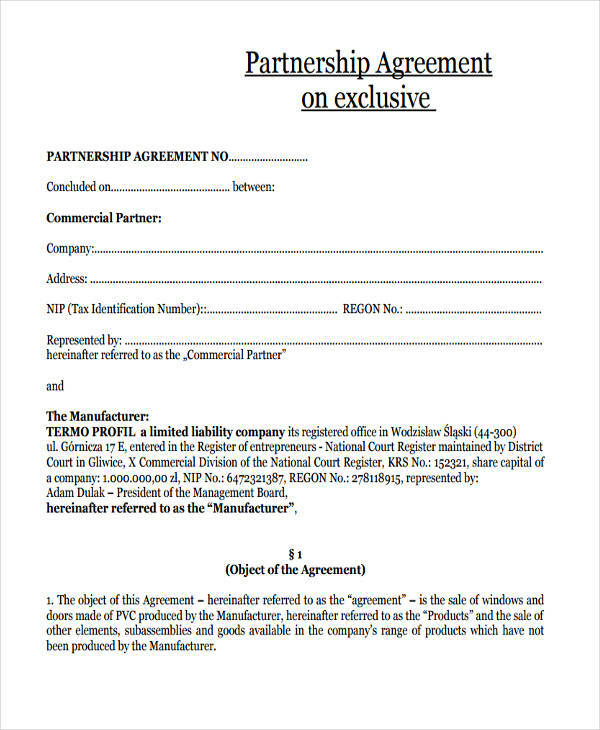 Business Partnership – a partnership is considered to be business in nature wherein two or more companies are in a mutual agreement to do work or simply merge as a single entity to undertake work that may be undertaken only after consolidating all of their assets which would have been very hard or virtually impossible to handle by one company alone. 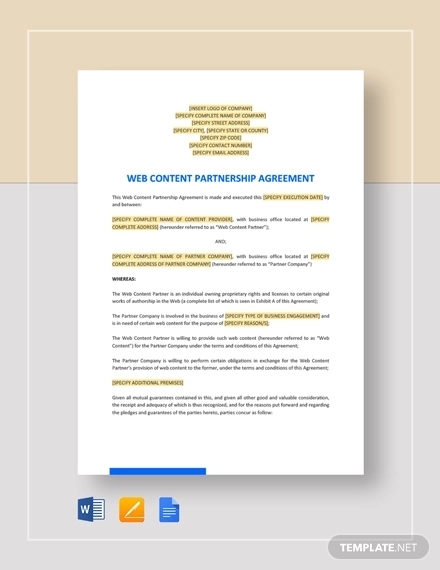 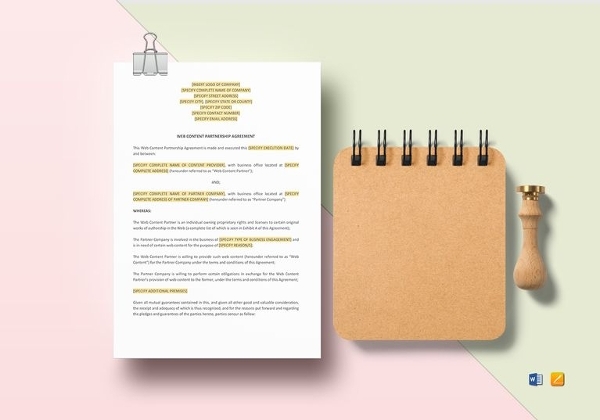 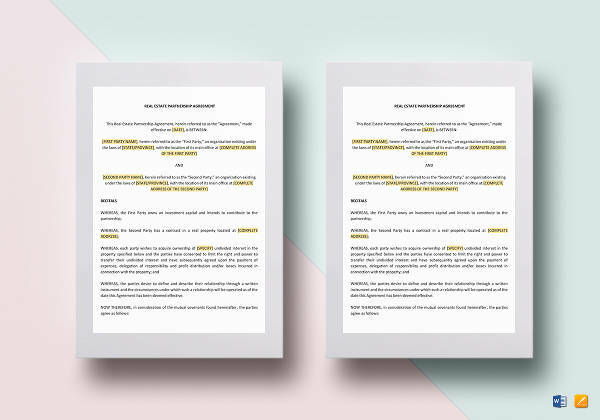 An example of a general business partnership agreement can be found at the top of the page for your reference. 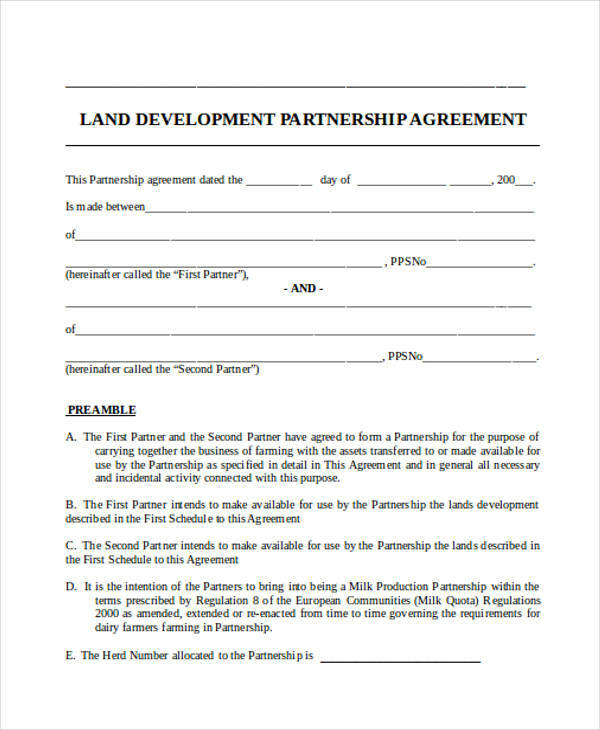 Political Partnership – is a partnership done usually by governments to advance their national interests. 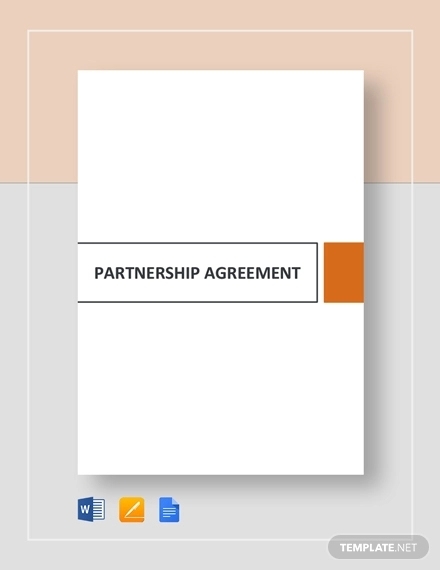 Political partnership thereby also affects business partnership relations in between the partner countries. 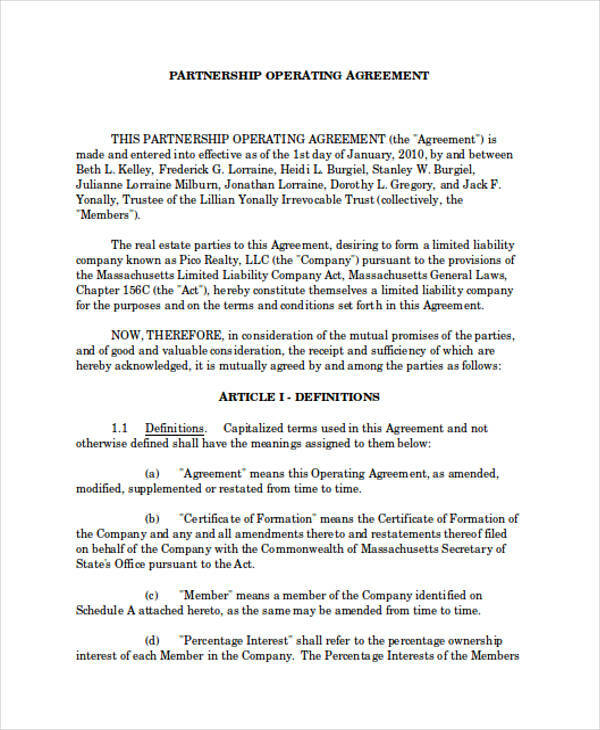 Individual – the most common among partnerships being in between two individuals who reach a consensus to stay together or live together. 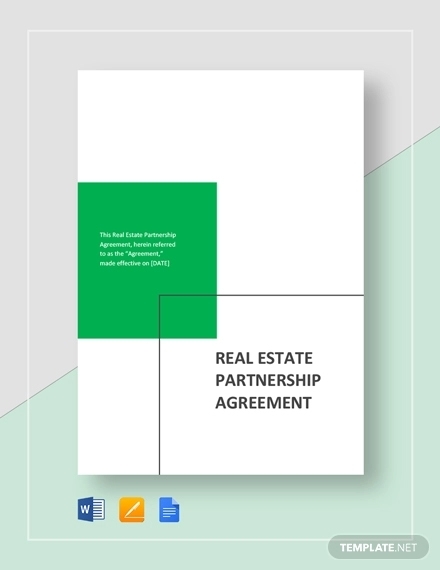 The type of partnership exists in determining the distribution of profit or losses among the partners. 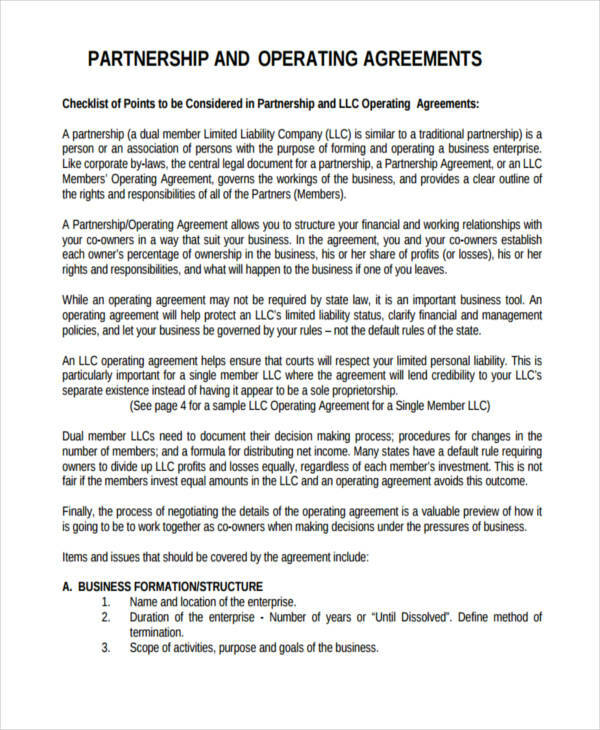 It also details the level of control the partner has in the actual management of the business or partnership. 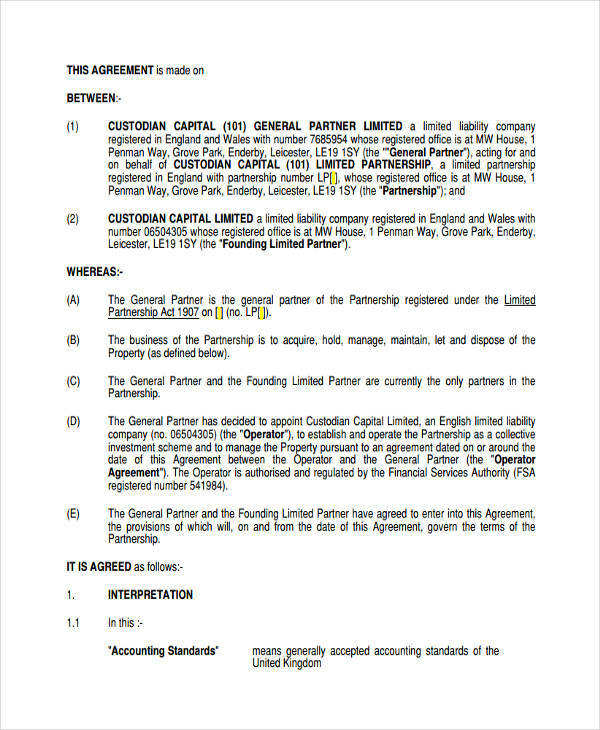 General Partnership – This type of partnership share equal responsibility and liability to all parties involved in the partnership. 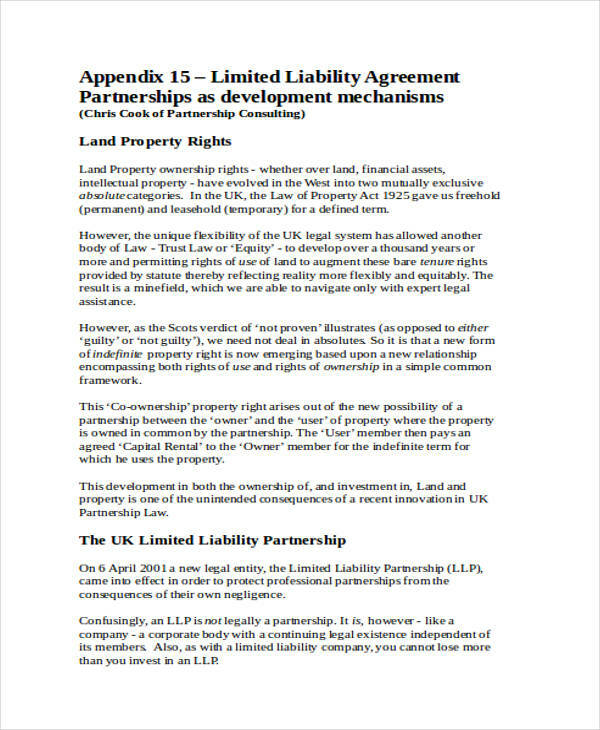 All parties involved have management rights and are liable to debts of the partnership. 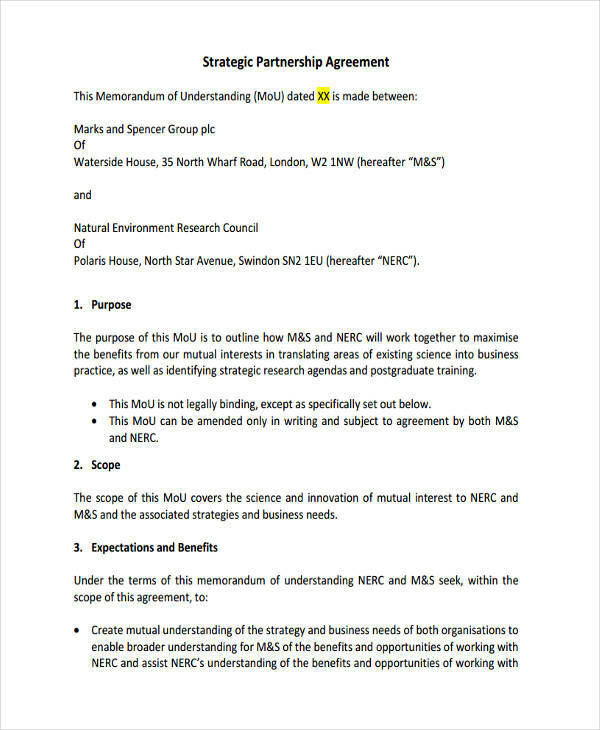 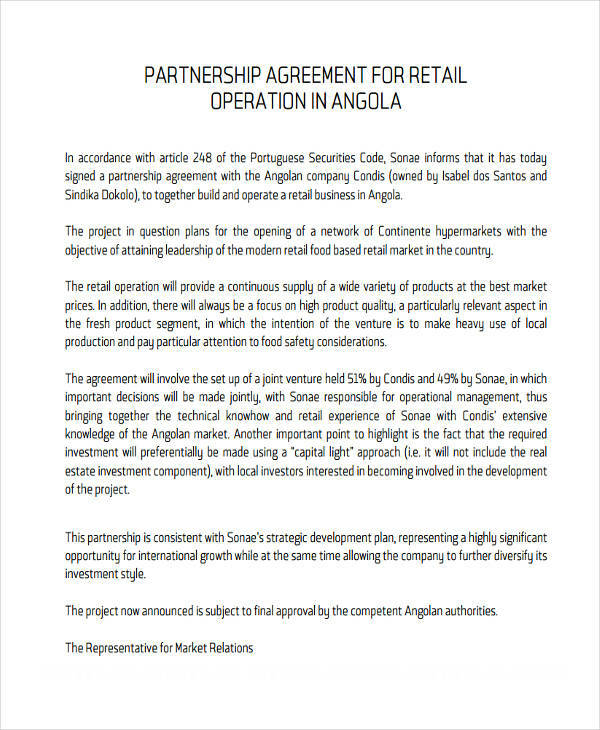 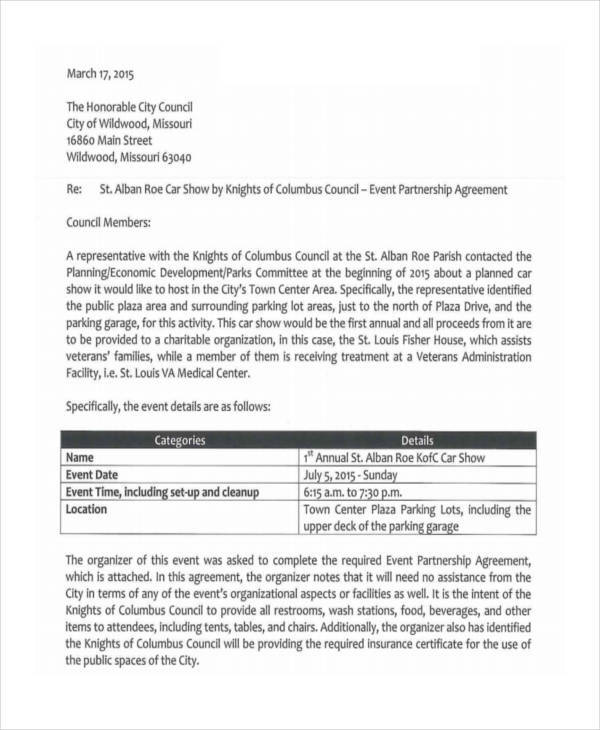 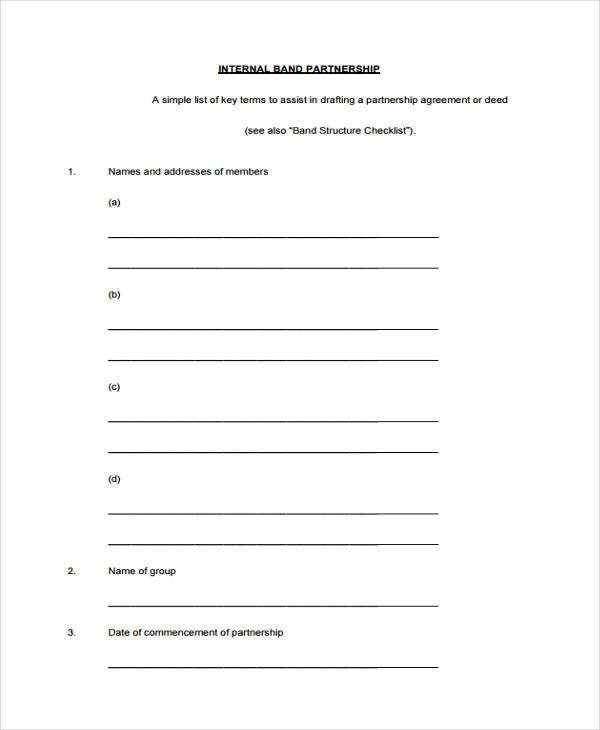 A general partnership agreement can be downloaded in the page for your reference. 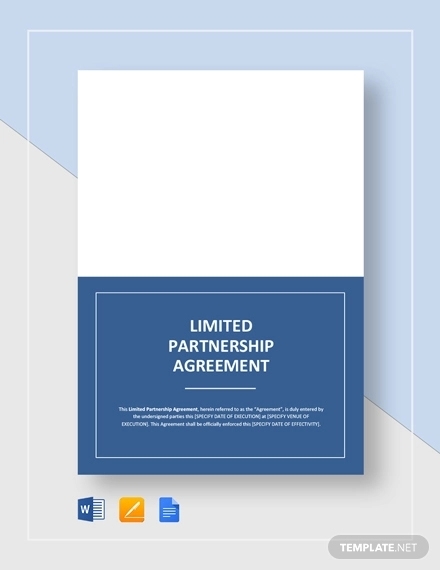 Limited Partnership – A limited partnership exists between a general partner and a limited partner. 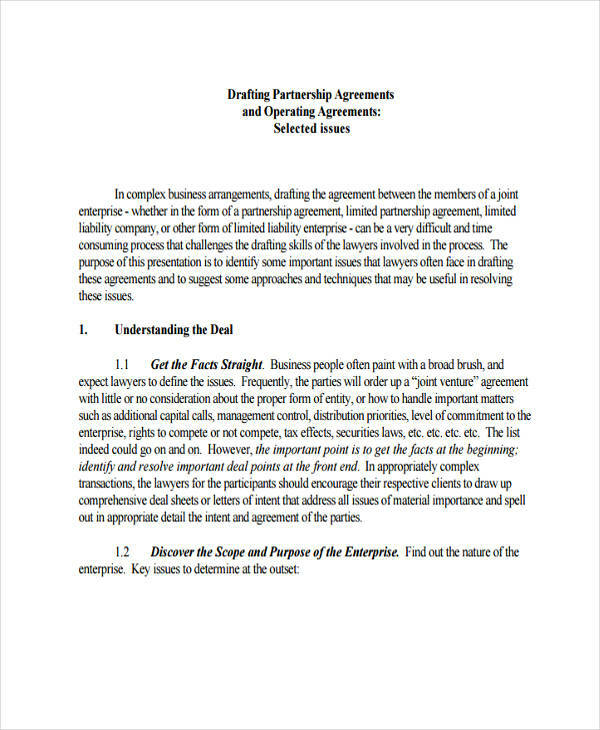 A limited partner in essence has no management right to the business and are not liable for any debts of the partnership. 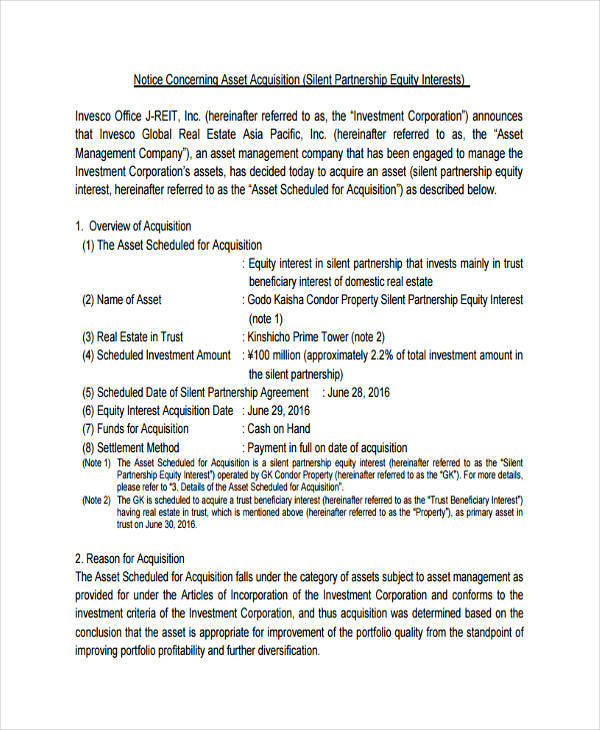 However, they are allowed a return on their investment. 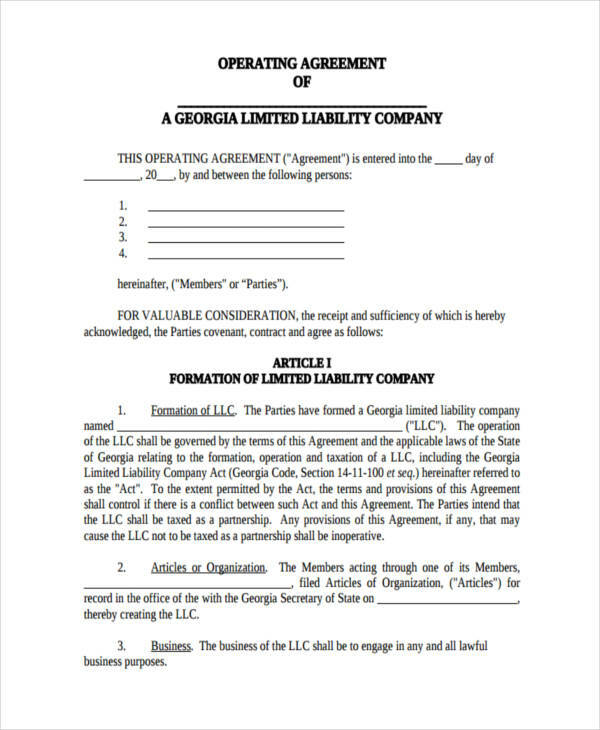 Limited Liability Partnership – Limited liability partners share no responsibility to any act of misconduct done by another partner. 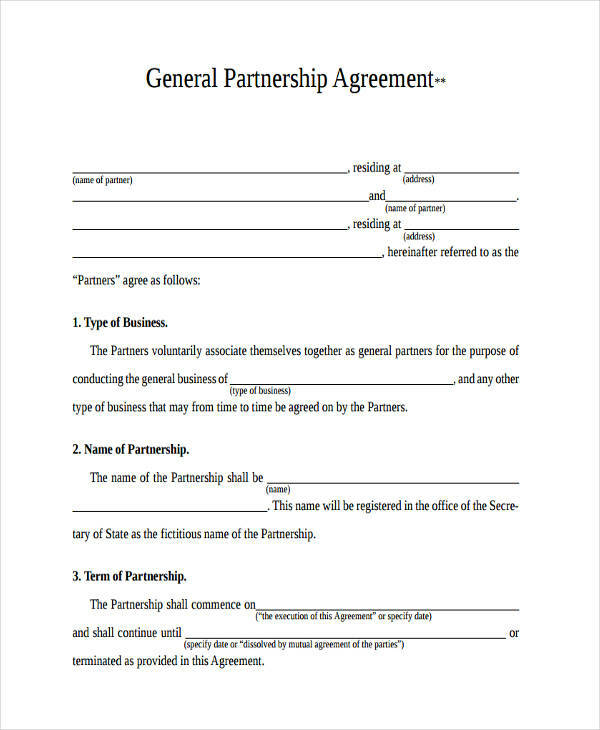 They differ from a limited partner in that a limited partner has to have a general or unlimited partner. 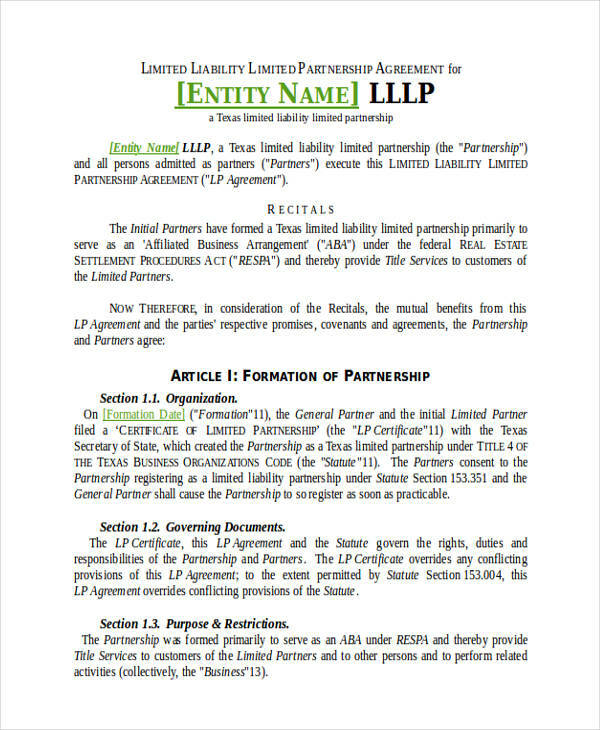 Limited Liability partners also have a different tax liability as compared to a limited partner. 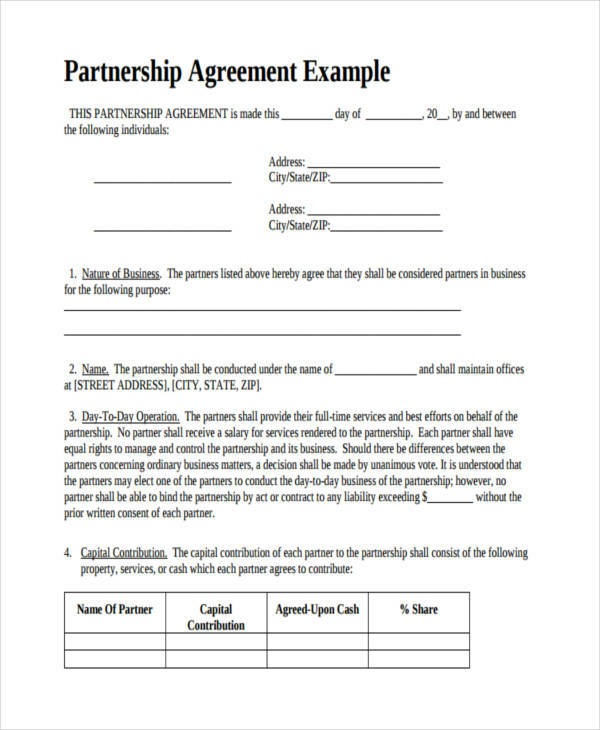 Each partner has a capital contribution at the start of any partnership. 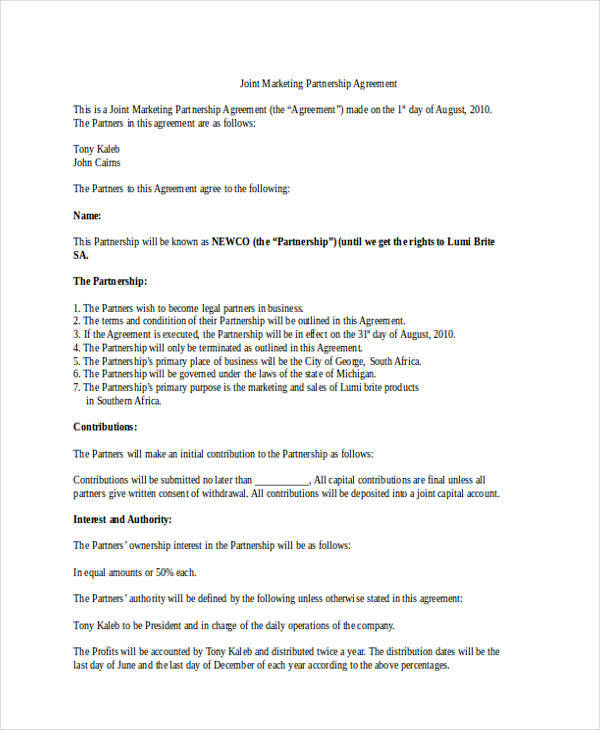 This would be the basis for percentage of ownership of the partnership. 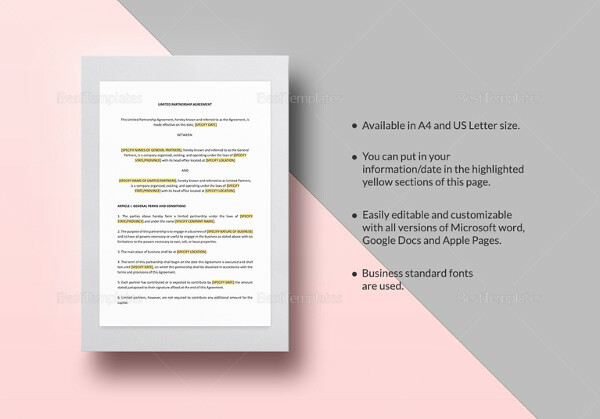 Profit and loss distribution can be distributed via a fixed percent distribution or equal share distribution. 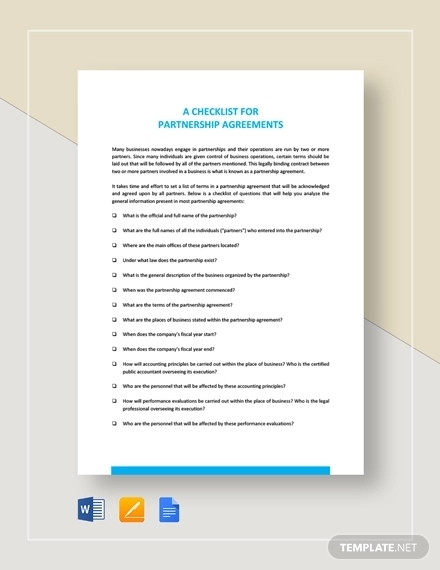 This is dependent upon what all partners have agreed on at the start of the partnership. 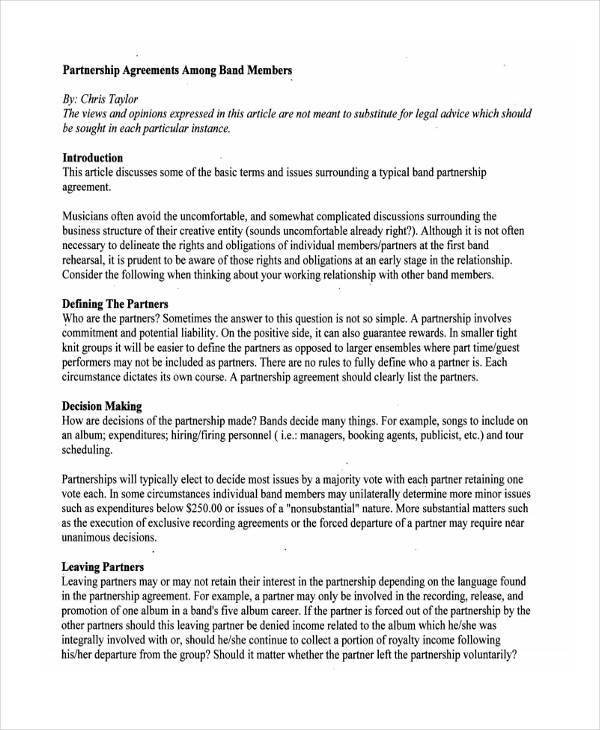 Profit and loss for each partner is a fixed number percentage and is given to each partner with the total percentage being 100% between all partners. 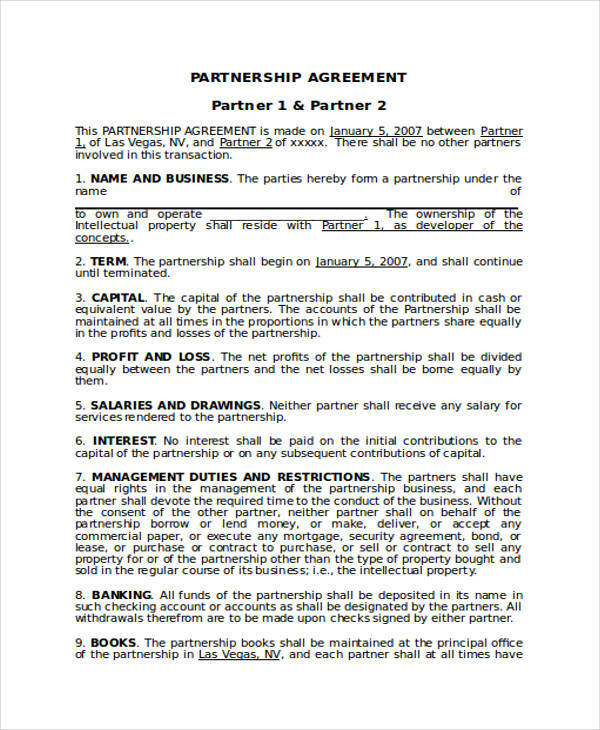 All partners get equal share of profits and liabilities incurred in the partnership. 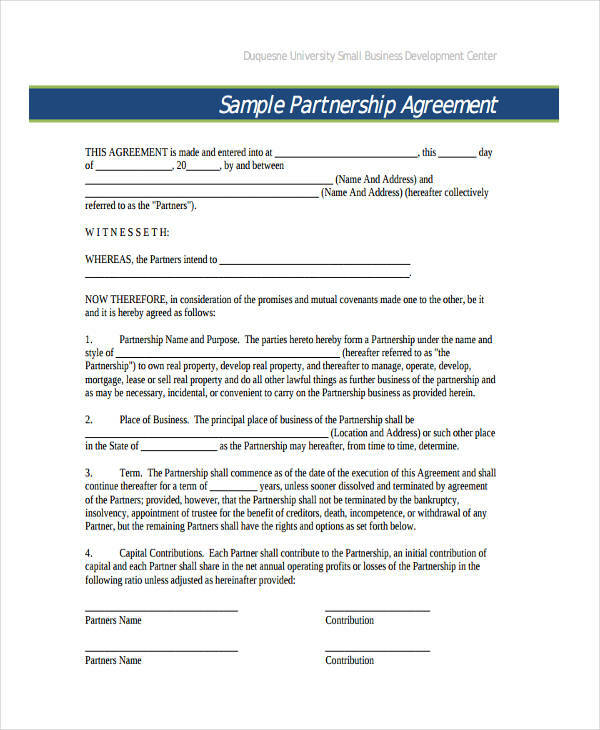 Non-voluntary – A partner ends the partnership agreement against his or her consent. 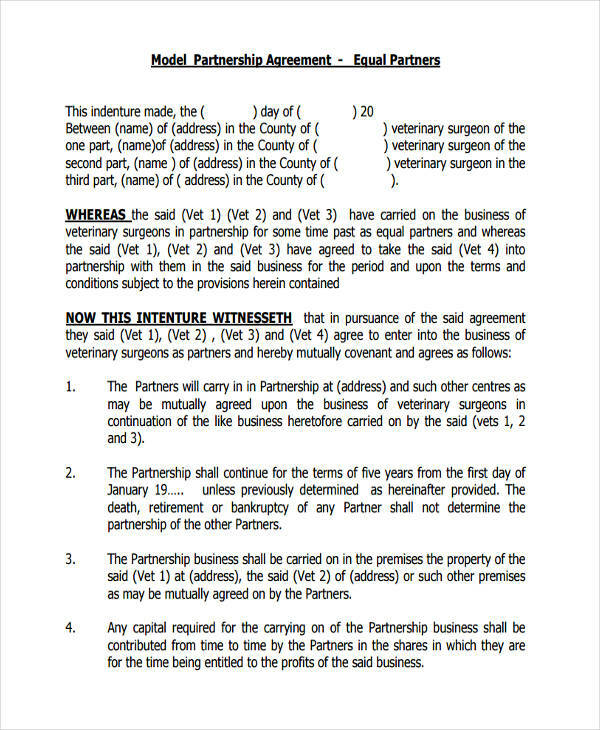 In some cases, these can be due to death or imprisonment. 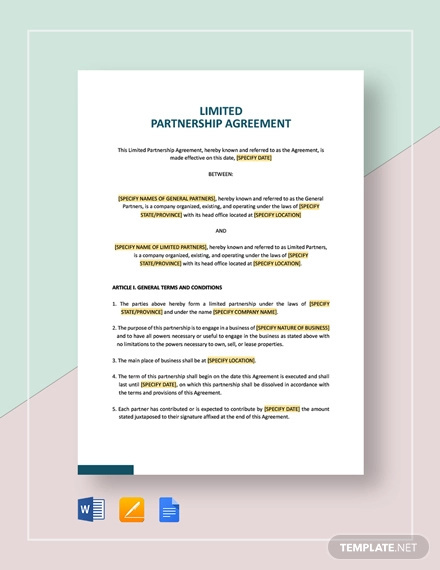 General Business Partnership – As briefly described under general partnership, this partnership entails the responsibilities of each partner regarding any profit or losses resulting from the partnership. 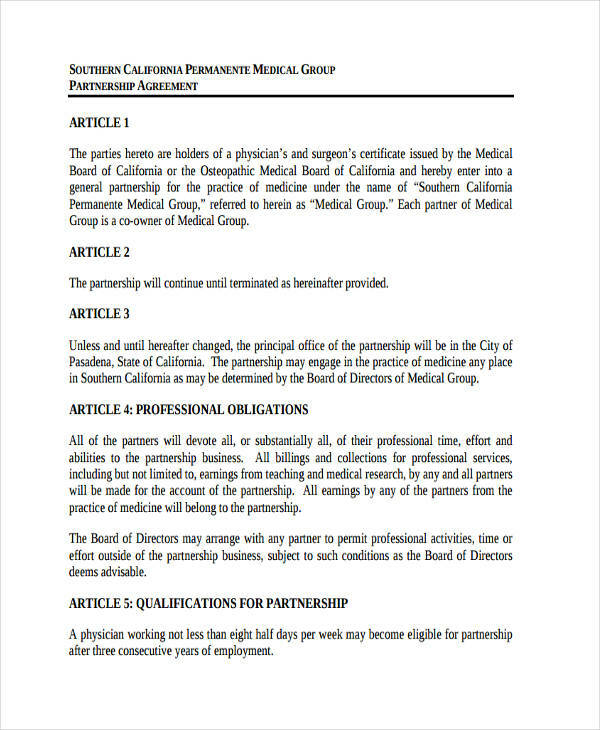 Examples for General Business Partnership Agreement can be found and downloaded from this page. 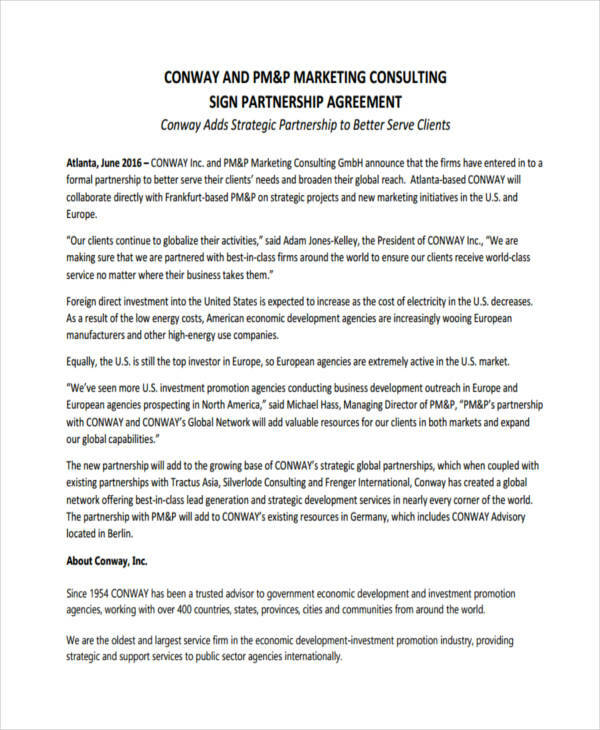 Strategic Partnership – This partnership happens between companies who each have resources that can mutually benefit one another. 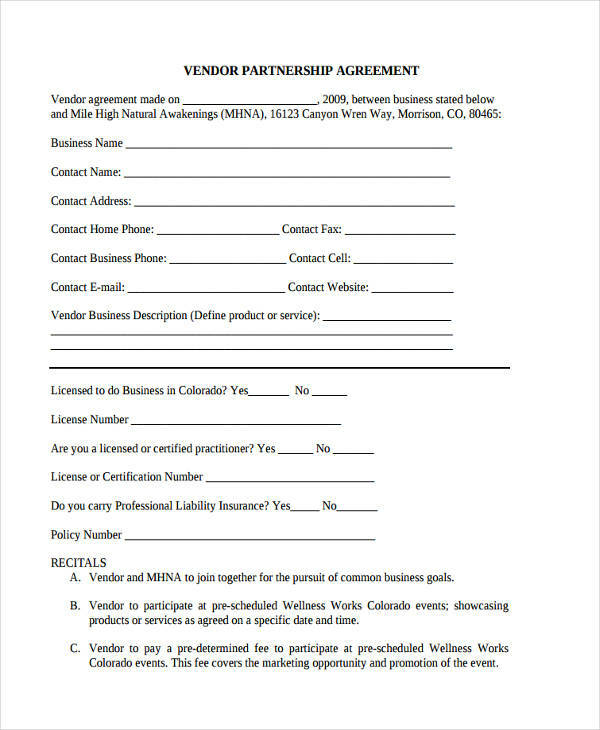 A great example for this would be between a manufacturer and a distributor. 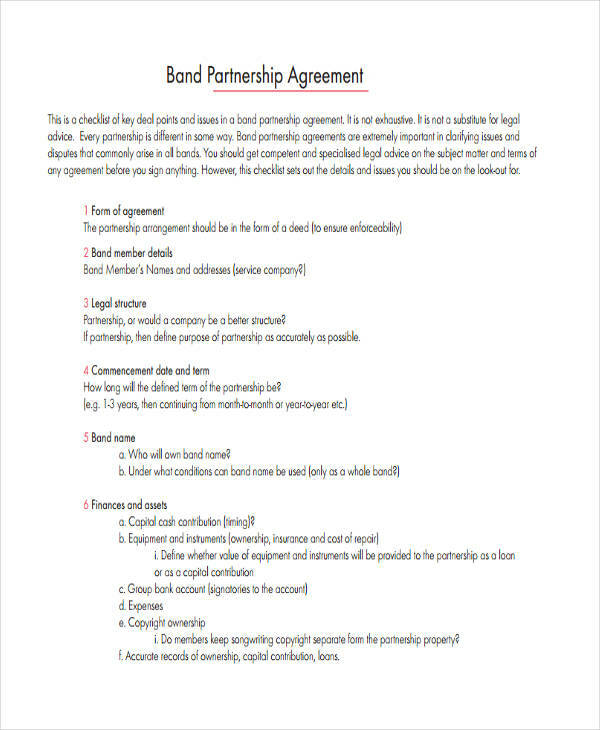 Band Partnership – happens between band members outlining the different aspects of the partnership which includes the handling of the profit, business decisions or management of the band, and purchases regarding equipment. 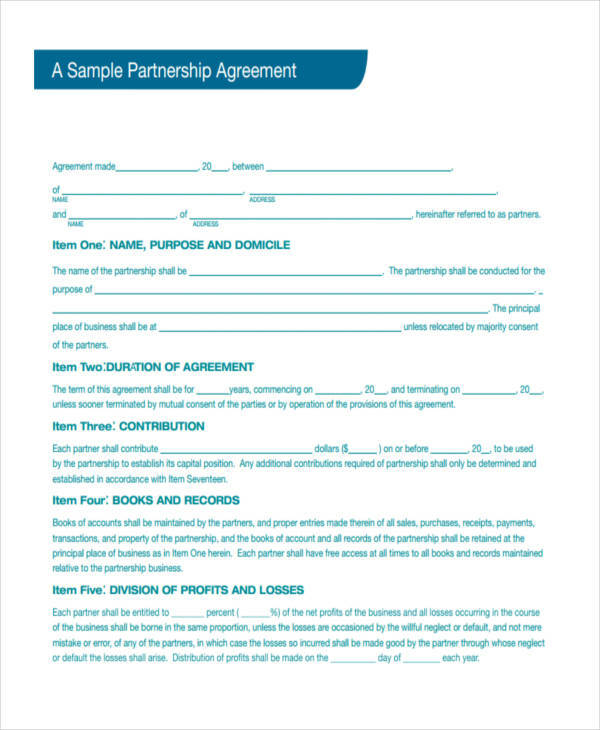 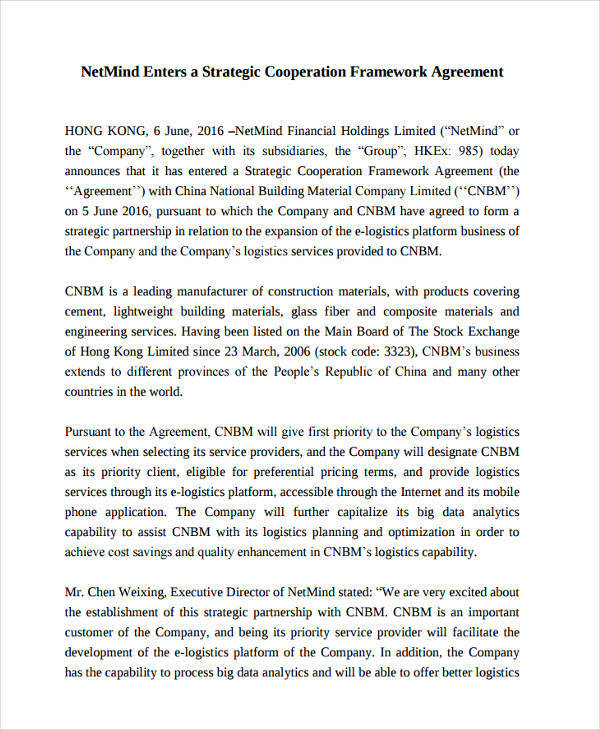 A sample draft of a band partnership agreement can be found and downloaded in this page. 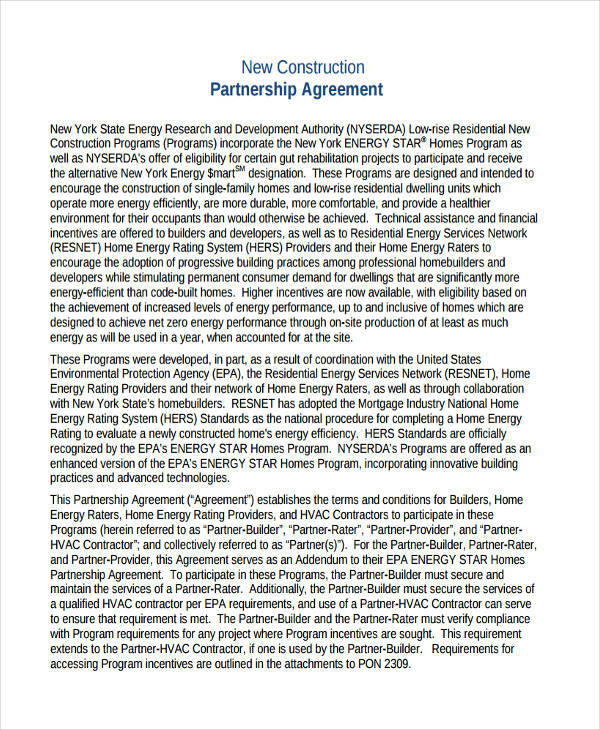 Construction Partnership – Exists between builders and contractors working together on an individual project. 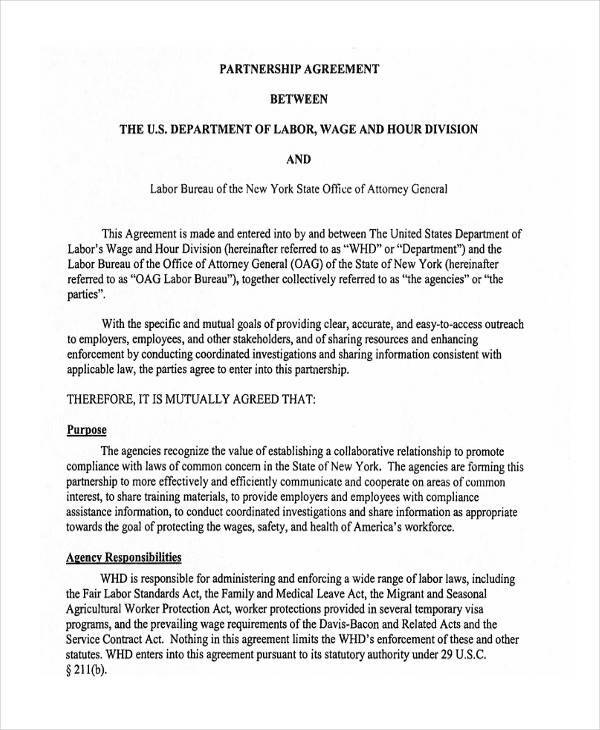 This usually insures efficient work distribution between management and labor. 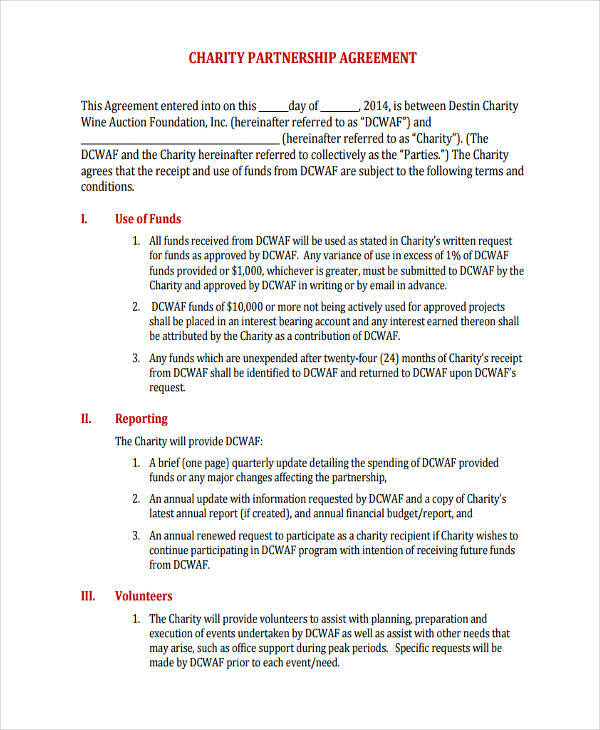 Charity Partnership – This agreement exists between a charitable organization and a corporation or sponsor. 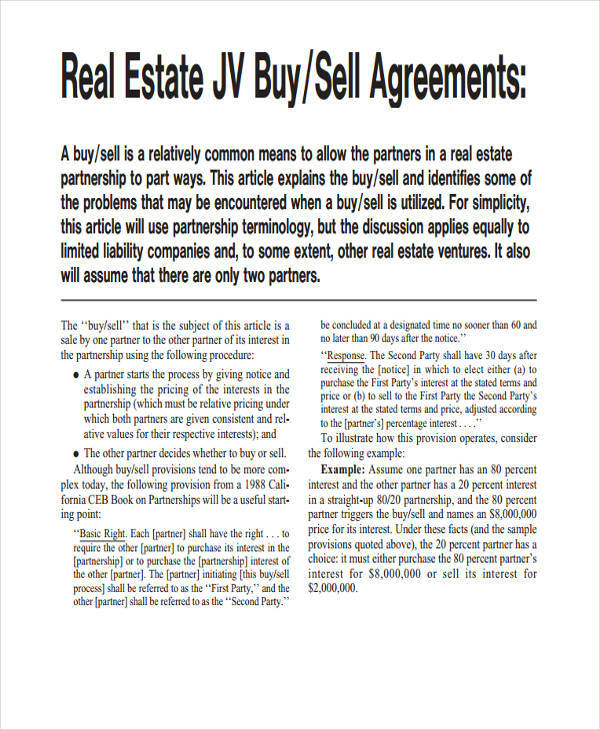 They make a mutual agreement for either a one time event or for a period of time. 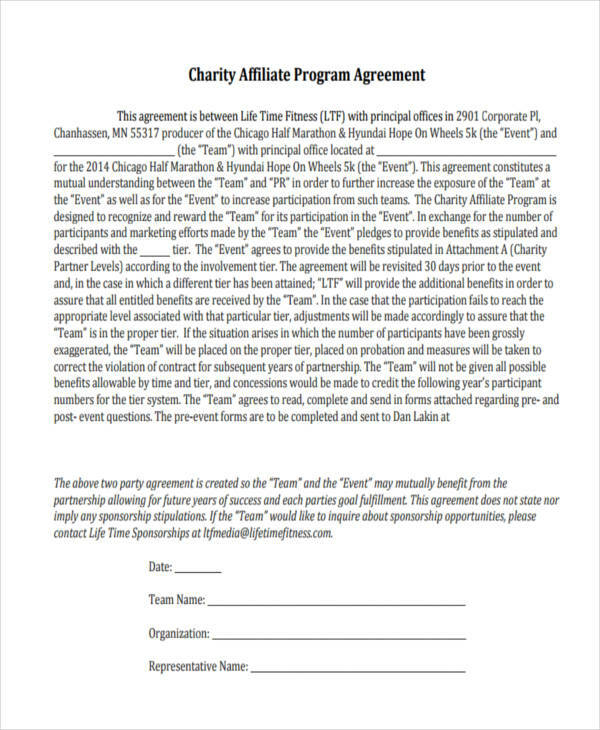 Event Partnership – As the name implies, this partnership is between an event organizer and sponsor or sponsors. 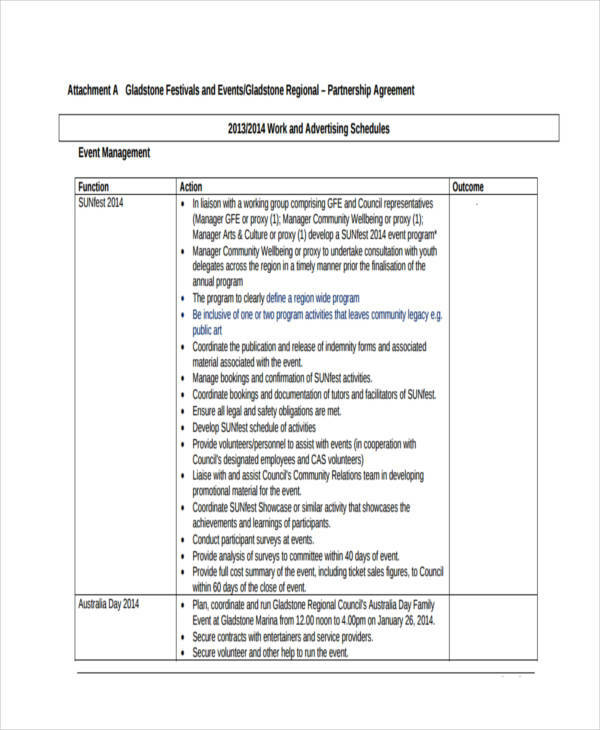 Depending on the event, the event organizers get funding from the sponsors while the sponsors get good PR, brand awareness, or simply get help in holding the event. 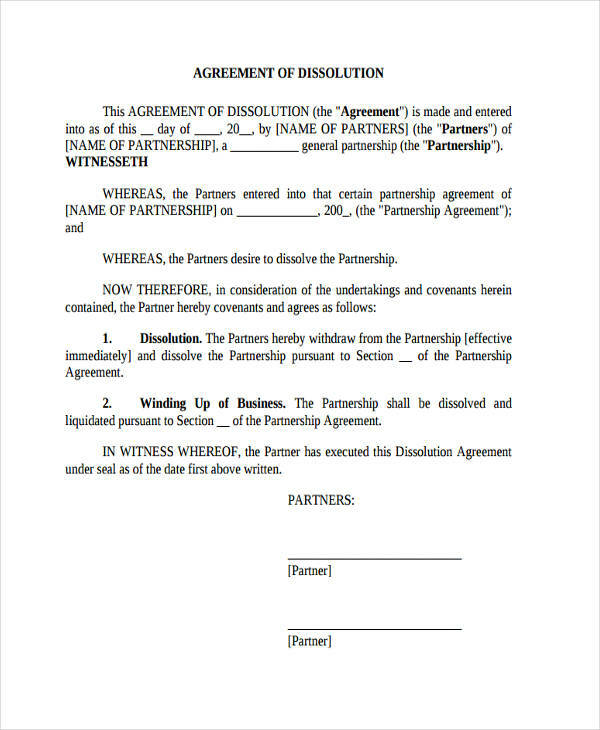 Partnership Dissolution – Partnerships can be dissolved dependent on the factors or circumstances behind the agreement. 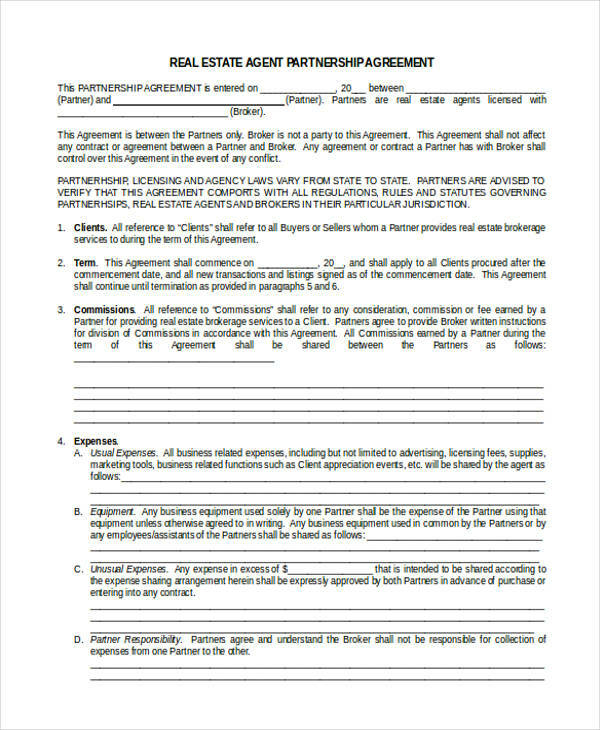 This agreement stipulates the distribution of assets and liabilities upon the end of a partnership or due to other reasons like bankruptcy or project completion. 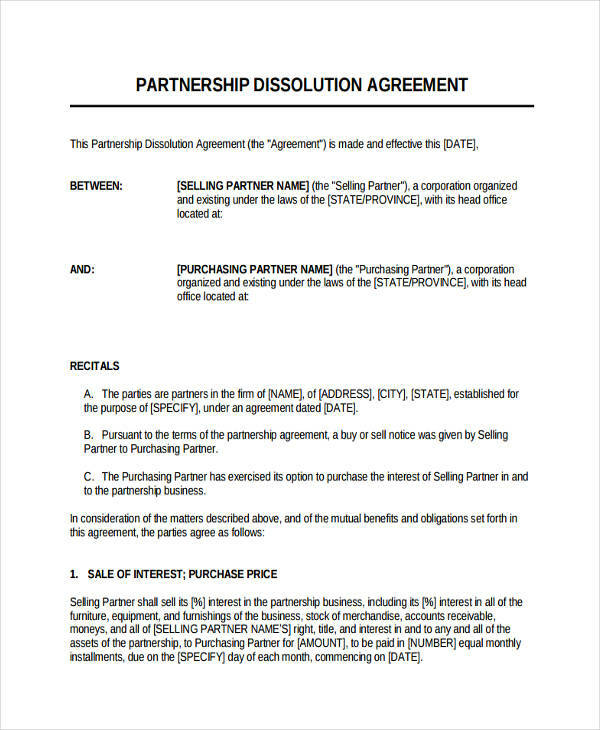 An example for a simple partnership dissolution agreement is on this page for reference.